It’s rare that Danish scholars venture outside Denmark. 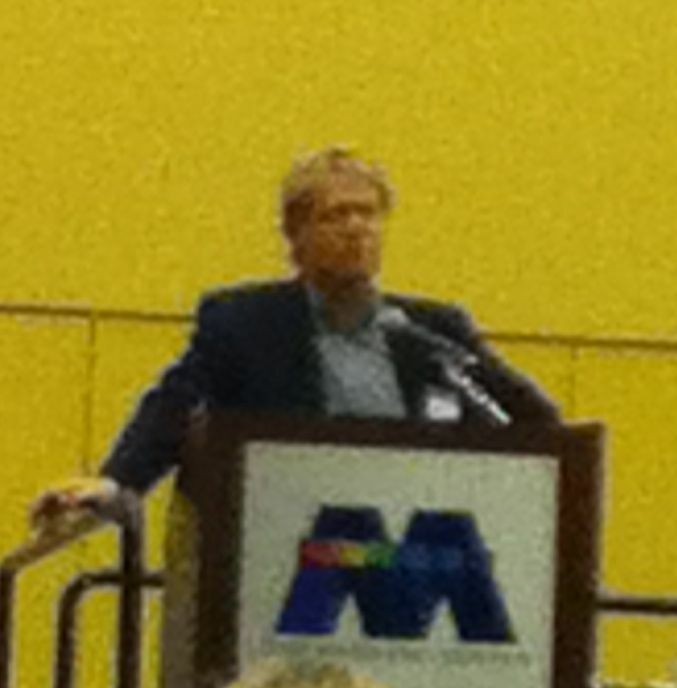 So it was a treat to hear Joakim Garff deliver a paper at the 2011 AAR meeting in San Francisco last November. (I’m sorry about the quality of the photo. I didn’t think to bring my camera, so I had to take it with my iPod Touch). Garff is trained as a theologian but his métier is aesthetics and literary theory. There’s been a lot of interest among contemporary Kierkegaard scholars in Kierkegaard’s aesthetics and his relation to art and rightly so. Kierkegaard is a consummate story teller as well as a lover of music. He often disparages art, but he is himself a type of artist, so his relation to art and, in particular to literature as a type of art, is deeply ambivalent. Garff’s paper, as the title of this post indicates, was an argument that Kierkegaard’s Practice in Christianity can be read as a Christian Bildungsroman. I’ll confess that I’m uncertain precisely what he means by “theology of autopsy,” or perhaps I should say I’m uncertain why he’s chosen that expression, because the latter half of that sentence makes perfect sense. That is, I think Garff is correct in his claim that Kierkegaard uses his rhetorical skills as a means of creating a semblance of contemporaneity in his reader with the historical person of Jesus. Few scholars would dispute that, though I believe most would argue that establishing what Kierkegaard would consider genuine contemporaneity in the spiritual sense is ultimately beyond the scope of rhetoric no matter how skillfully employed. The ambiguity of the relation between literary form and spiritual substance is one that runs throughout Kierkegaard’s entire authorship and which thus deserves to be treated in more detail. There are already some excellent works on the topic of Kierkegaard’s aesthetics, including Sylvia Walsh’s Living Poetically: Kierkegaard’s Existential Aesthetics (Penn State Press, 1994), but the topic is far from exhausted. I would argue that the specific topic of the Bildungsroman in Kierkegaard’s works deserves fuller treatment. Repetition, for example, is clearly a Bildungsroman, and one could argue that the whole of the authorship, particularly in light of Kierkegaard’s own comments on it in The Point of View, could be read as an extended Bildungsroman. Garff made a comment in passing that was so important it deserves to be repeated here. Someone asked him what he made of the pseudonymity of Practice in Christianity and he replied that he didn’t think it was particularly important. He said he thought scholars made too much of the issue of the pseudonymity of many of Kierkegaard’s works, that in some instances, at least, pseudonyms were last minute additions to works he’d originally planned to publish under his own name. I could not agree with Garff more an that point. Anyone who has spent any time reading Kierkegaard’s journals and papers, as well as the works he published under his own name, knows that the view contained in the pseudonymous works, more often than not, reflect Kierkegaard’s own views. I believe the pseudonyms were an aesthetic device, something to give a particular work a kind of symmetry, or closure, that the name of a real flesh and blood author affixed to them could not do.So there we are, back to aesthetics. Garff mentioned that he had a new book coming out soon, but would not divulge the topic. I wasn’t at the AAR, but I actually translated this paper for Joakim (and ‘garffdansk’ is no mean challenge!). I took his claim that Kierkegaard’s “teologiske diskurs er en slags autopsiens diskurs, for så vidt som den forsøger at suspendere tiden mellem Jesus af Nazareth og den moderne læser” to be an indirect reference to ‘troens autopsi’ in Fragments/Crumbs i.e. the idea of ‘seeing for oneself’ the events of sacred history (cf. the Hongs’ note on ‘autopsi’ in light of the Greek ‘autos’ + ‘optos’). Of course you know Smuler far better than I do, so I may be wrong about that. I say a bit more about autopsy and imaginatively-mediated contemporaneity with the past in paper in BJHP from a couple of years ago, and of course Marius Timann Mjaaland’s book ‘Autopsia’ goes into the subject in considerable depth. Thanks for these helpful references. I will confess, shamefacedly, that I have always read “autopsi” in Crumbs anachronistically. That is, I’ve always read it as having some sort of post-mortem connotation. It’s clear from the context, as well as the etymology, that it has to do with seeing for oneself, but I always took it to include an allusion to making the dead Christ living again through what one could call the eyes of faith. I suppose even that interpretation, if I’d thought longer about it, would have made Garff’s use of “autopsy” in his “theology of autopsy” make sense. “Seeing” the God-man for oneself is certainly central to Crumbs, but Crumbs is merely one work in a much larger oeuvre.. I don’t think it’s accurate to characterize Kierkegaard’s theological thought more generally as one of “autopsy.” He places enormous emphasis not merely on faith as a means of achieving contemporaneity with Christ, but also on the transformative nature of that contemporaneity and its ethical implications. It’s the substance of Christian existence in that latter sense, I would argue, that is the subject of most, if not all, of the religious writings that Kierkegaard published under his own name (i.e., of the explicitly theological writings). You’re quite right, I think, that the phenomenological/experiential dimension of contemporaniety is only a part of SK’s account of Christian existence, and also that ‘contemporaneity’ as a form of imaginatively-mediated experiential co-presence with Christ is notably absent in the veronymous works. It does crop up in some interesting places though – Anti-Climacus in Practice in Christianity and (or at least so I think) in the discussion of the 1800 years that separates the believer from the event of the incarnation in The Book on Adler. Still, when he writes in The Moment that contemporaneity has been his “life’s thought,” he seems to mean something closer to the comprehensive, practical, ethical sense that you point to rather that the phenomenal sense. The wording in my blog post comes from Garff’s abstract. I’ll bet your revisions were done after the abstract and that Garff just never bothered to change the abstract. “Familiarity” works well, in that context, as a translation of “fortrolighed.” In no way would I call your translation inept. Garff can be very eloquent, but he can also veer a little too much into post-modernist verbiage. That’s what characterizes Gaffdansk, as such and what makes it sometimes difficult to translate. I feared that may have been what had happened with the passage in question. Sounds to me though like the abstract was simply a first run through that was never revised the way the paper itself was. God help me if anyone ever saw the first run throughs of my own translations! The fault is Garff’s not yours. He should have had you check the abstract before he sent it to me. Now I’ll let you in on a little secret. Danes think pretty much any native English speaker with even a rudimentary knowledge of Danish can translate from Danish into English. My impression is that they think English is a pretty primitive language without a lot of nuance and that it thus doesn’t make much difference how one says something in English. There are more than a few people translating from Danish to English who know hardly any Danish and whose translations are thus pretty bad. Many Danes don’t seem to care though, I think they figure English is English. That may lie behind Garff’s failure to let you have a second go at the abstract. Hey, it was already in English right? He can be a little cavalier about such things as the SAK controversy made all too clear. Next Next post: Glowing Review of Ways of Knowing!